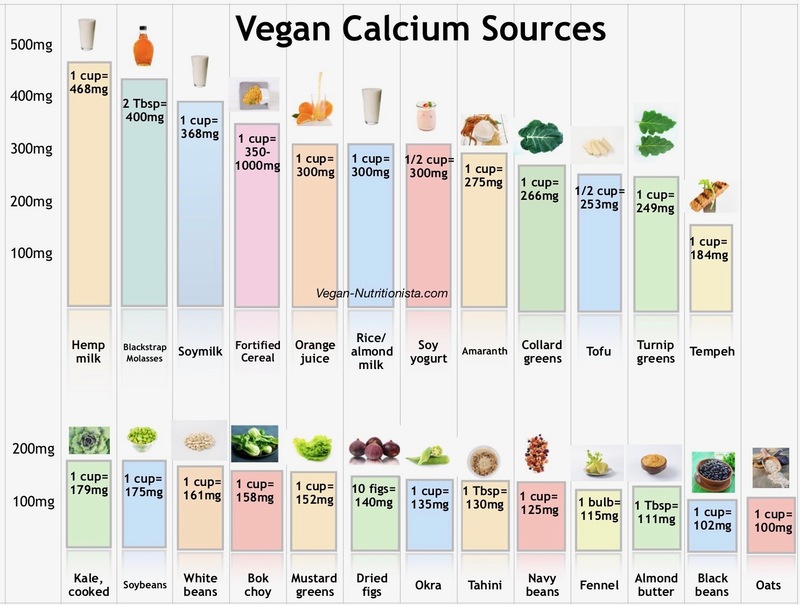 If you’re coming here to find vegan calcium sources, my best guess is someone is harassing you about whether you can possibly get enough calcium on a vegan diet. Maybe your mom, or your in-laws, or that coworker who is super fit and crushes meat and dairy and says she’s never felt better. I know any time I look up sources of something, I’m looking to back up my beliefs with hard data. So, I’m happy to oblige. Let me just put this here to start: you can get plenty of calcium without drinking milk. A huge percentage of the human population either has a hard time digesting milk or cannot do it whatsoever. The estimate is that 65% are lactose intolerant, and more have digestive issues when eating it. (https://ghr.nlm.nih.gov/condition/lactose-intolerance) This isn’t too shocking when you think about the fact that milk is the food the mother animal’s body creates to nurse that particular animal from infancy into the time when they can feed on their own. Cow’s milk is specially designed for calves, not humans. Humans started drinking it because it was readily available and they grew to enjoy the flavor. This does not mean we need it to survive and certainly not to thrive. Human bodies do not need to drink dairy to get enough calcium. I know people who just deal with lactose intolerance by drinking milk with lactase added into it to help digest it, and I know others who just deal with their intolerance in the bathroom. What ever is the point? There are so many fundamentally delicious alternatives to milk and cheese nowadays that there’s no sense in suffering just because you have always eaten these foods. Personally, I do not worry about calcium at all. What I do is make sure we are eating a wide variety of fruits, vegetables, beans, nuts and seeds each day. That’s it. During one of my pregnancies I agreed to chart what we were regularly eating just to be sure I was getting enough protein, calcium, iron, and folate and I stopped after a week. Why? Because a whole foods, plant-based diet is truly wonderful and I was getting more than enough of everything I needed each day. I’ve had people say before that while there are vegan calcium sources available, it’s easier to just drink a glass of cow’s milk or take some calcium supplements and get all their requirements in one. What they need to remember is that the body can’t actually absorb all of those milligrams of calcium. For instance, a glass of milk has 300 mg of calcium, but we can only take in 30% of that, so it’s really only 90 mg. To be fair, that happens with vegetables too, but some have higher absorption rates so you can get more from less. You can also get around 100mg from almonds and broccoli, and 50mg of calcium from fruits like blueberries, dates, black currants, artichokes, oranges, apricots, butternut squash, raisins, carrots, Brussels sprouts, sweet potatoes, cauliflower, lentils, all beans, corn tortillas, whole wheat bread, and so many other vegan foods.